There are basically two issues that will affect lenders and landlords – budget-forced court layoffs and closures, and a new law offering legal help to people who cannot afford to hire it on their own to fight foreclosure and eviction. The former, clogged court processes has resulted from reductions of court staffs throughout California. As a result, the timing of unlawful detainer cases flowing through the court system has slowed down. For uncontested cases, the time line from filing the unlawful detainer to a Sheriff lock-out has been delayed two to four weeks, an average time frame is 35 to 45 days. For contested cases, the time frame jumped from 35 to 45 days to 55 to 75 days. The second effect is the Sergeant Shriver Civil Counsel Act, implemented in San Diego and Los Angeles County this year as their pilot program. This law gives poor residents the right to an attorney in unlawful detainer actions by funding the legal costs. The courts notify defendants of unlawful detainers and provide the names and phone numbers of lawyers participating in the program. Defendants are also approached at the courthouse. Once retained, the Shriver Act attorneys file an answer to contest the case which is frequently accompanied by a jury demand. Accompanying the answer is typically “discovery” which is the fact finding process of a lawsuit requiring depositions, written interrogatories, or request for production of documents, previously rarely used in unlawful detainer actions. They also consider filing delaying motions including motions to quash and demurrers. The mere filing of these extraordinary actions gains leverage for the tenant and puts the landlord at jeopardy for the defendants’ attorneys’ fees, especially if they lose the case in front of a jury. This is just a summary of KT&S’s alert, you may get the full brief at kts-law.com, or by calling 800-338-6039. The point is if you are either a landlord or a lender with a default problem, contact your legal counsel. For people who have longed to find an area to live in that provides safe neighborhoods, beautiful lawns, sprawling homes, and an inviting atmosphere, homes for sale in Rancho Santa Fe may be the perfect solution. Living in Rancho Santa Fe opens many doors of opportunity for people to plant their roots and begin building a solid foundation with their families. Families, young and old, enjoy settling down and living and working in this beautiful area. This is understandable because the area offers a wide assortment of available homes to choose from, as well as festivals, outdoor entertainment options, nightlife entertainment, and beautiful parks for people to enjoy. Unlike many suburbs, the homes of Rancho Santa Fe are unique in design and offer choices in different exteriors, multi-levels, beautiful patio options, and exquisite interior floor plans with unique dimensions and living space arrangements. Green golf courses and premium shopping centers appeal to residents of this area. People who enjoy spending time outdoors and who savor a thriving suburb that offers a feeling of family and community will find they fit in well in this sunny and warm region. Think you can’t afford a Rancho Santa Fe home? You might be surprised. Don’t think you can afford a home in San Diego County’s Rancho Santa Fe region? Think again. The real estate slowdown, along with a sluggish local and national economy, have combined to lower prices in this desirable market. And this means that you might be able to find your dream home in Rancho Santa Fe at a price that you can afford. Rancho Santa Fe remains a highly desirable community. The natural beauty, eclectic mix of restaurants and shops, plentiful green spaces and, of course, the amazing weather make this a place that people want to call home. Because of the demand, homes for sale in Rancho Santa Fe have traditionally fetched high price tags. It’s still not unusual, even with the changing local real estate market, to see homes with asking prices of $12 million or more in this coveted swath of San Diego County. 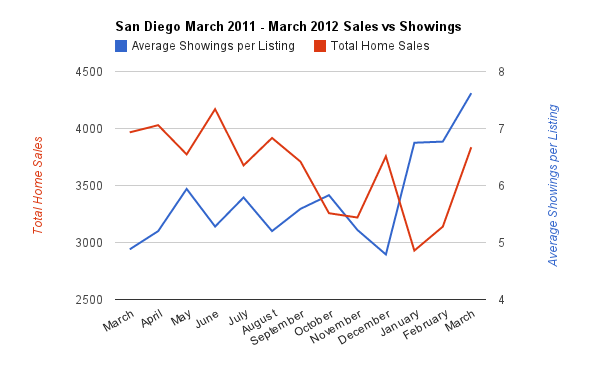 San Diego home showings have been on the rise since December, and the Sales have caught up! Overall inventory is down in most areas of San Diego. We are seeing increased demand from buyers due to extremely attractive interest rates. Showing Suite data shows the impact the increased interest translated to increased showing activity which lead to sales. Sellers have sat on the sidelines unless forced to sell under sometimes distressed situations. While prices are slow to catch up to the year over year value decreases, time on market is also decreasing. This is positive for sellers no matter what your circumstances. What is now the time to buy? The Bottom has hit! Foreclosures are decreasing and Job growth is increasing, which is stabilizing and shifting the market. CNN Money is predicting and much more sunny picture of the real estate market than others would have you believe. This information should stave off skeptics seeing ‘Shadow’ Inventory waiting in the wings to crash the market in an election year. The last Presidential election cycle, in 2008 had the economy in the gutter, while we aren’t back to where we were in 2004, GDP is up, Job #s are up, which are the 2 strongest indicators in consumer confidence. So come on 2013, it’s only getting better from here on!